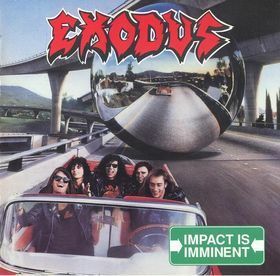 Impact Is Imminent is the fourth album by thrash metal band Exodus and their first with Capitol Records. This is the first album to feature John Tempesta on drums and is the last studio album to feature Rob McKillop on bass, though he would appear on their next live album, "Good Friendly Violent Fun" and on their 1992 compilation album, "Lessons in Violence." It was re-released in 2008 in a limited edition mini-album packaging to resemble the original vinyl release, including the inner sleeve.